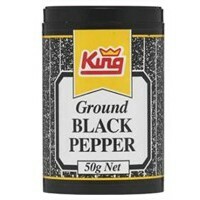 Ground black pepper has a hot, earthy flavour. Made from unripe corns of the pepper vine, picked early, sun dried then finely ground. Both versatile and popular, ground black pepper can be used to flavour numerous dishes while cooking, or used for additional seasoning at the table.